March 12 (Bloomberg) -- Crude oil traded above $82 a barrel in New York, poised for a weekly gain, on optimism fuel demand will increase amid improved prospects for an economic recovery in the U.S., the world’s biggest energy consumer. Oil rose 0.2 percent today after the number of Americans filing first-time claims for jobless benefits fell for a second week, Labor Department figures showed yesterday. The Organization of Petroleum Exporting Countries is set to increase shipments at the end of the month on strong demand from China. “There’s a consensus that the economy is growing, but also a great deal of uncertainty about the strength of the recovery,” said Peter Beutel, president of trading adviser Cameron Hanover Inc. in New Canaan, Connecticut. Crude oil for April delivery traded at $82.31 a barrel, up 20 cents, in electronic trading on the New York Mercantile Exchange at 10:21 a.m. Sydney time. Yesterday, the contract rose 2 cents to $82.11. Futures are poised for a 1 percent gain for the week. Oil fluctuated yesterday as the dollar changed direction against the euro on conflicting economic news. Reports from the U.S. government showed that the country’s trade deficit narrowed, indicating a slowing recovery, while jobless claims decreased. The dollar traded at $1.3682 against the euro at 10:24 a.m. Sydney time, from $1.3681 yesterday. The strength of the dollar has guided commodity prices over the past three years as investors look at raw materials as a store for value. OPEC will increase shipments on strong demand in China during the four weeks ending March 27, according to consultant Oil Movements. The group will raise exports by sea to 23.2 million barrels a day, up 0.9 percent from 23 million in the month ended March 20, the Halifax, England-based tanker-tracker said yesterday. OPEC ministers are scheduled to meet and discuss production targets in Vienna on March 17. Shokri Ghanem, chairman of Libya’s National Oil Corp., said “no new decision is expected” at the meeting, according to a March 9 statement. Fewer Americans filed first-time claims for jobless benefits last week, a report from the Labor Department showed. Initial applications dropped by 6,000 to 462,000 in the week ended March 6. The number of people receiving unemployment insurance increased, while those getting extended benefits fell. Brent crude oil for April delivery dropped 20 cents to end the session at $80.28 a barrel on the London-based ICE Futures Europe exchange yesterday. March 12 (Bloomberg) -- The yen fell for a third day against the euro on speculation the Bank of Japan will take further steps to add funds into its financial system as the world’s second-largest economy struggles with deflation. The euro headed for a weekly gain versus the dollar as signs Greece’s deficit crisis has been contained increased demand for the 16-nation currency. The yen also declined against 15 of its 16 major counterparts as U.S. stock gains damped demand for the Japanese currency as a refuge. The yen dropped to 124.09 per euro as of 8:32 a.m. in Tokyo from 123.82 in New York yesterday after earlier falling to 124.15, the weakest level since Feb. 23. Japan’s currency traded at 90.69 per dollar from 90.51. The euro was at $1.3678 from $1.3681, having strengthened 0.4 percent this week. The yen headed for a second weekly decline versus the dollar as the Bank of Japan prepares to hold its next two-day policy meeting on March 16 and 17. The central bank’s options include expanding a 10 trillion yen ($110 billion) fund providing loans to banks, according to two central bank officials who spoke on condition of anonymity. FCPO May Futures contract traded RM25 lower as compare to previous trading sessions to close at RM2650 with a total of 10,826 lots traded in the market. FCPO price traded lower despite opened slightly higher as crude oil and soybean oil was trade firm during overnight trading but weak during electronic trading. FCPO price was mainly trading within range from RM2700 to RM2654 regions during trading sessions despite huge price movement for soybean oil and crude oil trading. , FCPO price seems manage to rebound 38.1% Fibonacci resistance levels at RM2673 regions and manage to test support levels at RM2650 regions few minutes before FCPO closed for trading. Technically, FCPO price seems possible riding on wave C trading south where next nearest support levels were seen at RM2632 and RM2607 region; both at 61.8% and 78.6% Fibonacci support levels. However, FCPO price must violate resistance levels at RM2678 and RM2726 in order for correction wave to remain intact firm. FKLI March Futures contract was traded 12 points lower as compare to previous trading session to close at 1321 levels with a total of 6,657 lots traded in the market. FKLI was trade lower after reached high at 1337 regions as Dow Jones electronic trading were traded lower despite of the regional indices were settle on green upon end of trading sessions. 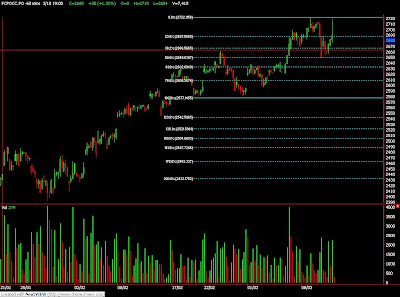 FKLI traded lower after failed in attempt to penetrate resistance levels at 1337 levels, 378.6% Fibonacci resistance levels. Technically, FKLI seem would trade lower after previous support levels at 1324 was being penetrate during trading sessions. However, FKLI would further affirm on correction wave provided nearest support levels at 1316 and 1288 was further affiliate in the coming trading sessions. 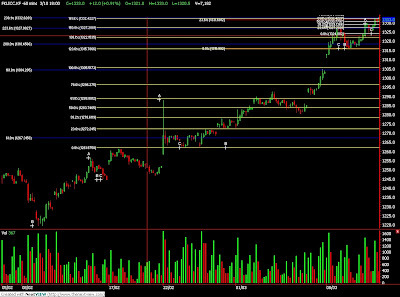 Resistance levels were seen at 1329 and 1337 regions. March 11 (Bloomberg) -- Crude oil traded below $82 a barrel after rising on a government report that showed U.S. fuel supplies declined, adding to signs of demand recovery in the biggest energy-consuming nation. Oil rose to an eight-week high yesterday as gasoline inventories dropped 2.96 million barrels last week, the Energy Information Administration said. Crude stockpiles increased 1.4 million barrels compared with a Bloomberg News survey forecast of a 2 million-barrel gain. Prices also gained as total Chinese exports climbed 46 percent in February. Crude oil for April delivery traded at $81.74 a barrel, down 35 cents, in electronic trading on the New York Mercantile Exchange at 11:22 a.m. Sydney time. Yesterday, the contract rose 60 cents, or 0.7 percent, to $82.09, the highest settlement since Jan. 11. Oil also advanced after the Organization of Petroleum Exporting Countries predicted members will need to produce more oil than previously forecast. The 12-member group will need to pump 28.94 million barrels a day to satisfy demand in 2010, according to a report yesterday. That’s about 190,000 barrels a day more than last month’s projection. Total U.S. fuel consumption increased 0.2 percent to 19.7 million barrels a day last week, the highest level since August, the Energy Department report showed. Refineries operated at 80.7 percent of capacity, falling for the first time in five weeks. Supplies of distillate fuel, a category that includes heating oil and diesel, decreased 2.22 million barrels to 149.6 million, the department said. Stockpiles were forecast to drop by 1 million barrels. Chinese exports climbed 46 percent in February from a year before after a 21 percent advance in January, the customs bureau reported on its Web site yesterday. The country’s passenger car sales rose 55 percent last month from a year earlier, the China Association of Automobile Manufacturers said this week. China is the world’s second-biggest oil-consuming country after the U.S.
Brent crude oil for April delivery rose 57 cents, or 0.7 percent, to end the session at $80.48 a barrel on the London- based ICE Futures Europe exchange yesterday. March 10 (Bloomberg) -- Soybeans rose to a one-week high after the U.S. said inventories will be smaller than forecast and that China purchased supplies from American exporters. Stockpiles on Aug. 31 will total 190 million bushels, less than the 210 million projected in February, the U.S. Department of Agriculture said today in a report. The average estimate of 20 analysts surveyed by Bloomberg was for 193 million. China, the biggest buyer, purchased 110,000 metric tons for delivery in the year that begins Sept. 1, the USDA said today. “The U.S. soybean stockpiles are going to be tight again this year,” said David Smoldt, the vice president of operations at FCStone LLC in West Des Moines, Iowa. The China purchase is a “positive sign” because it means U.S. supplies remain attractive, even with record crops expected in South America, Smoldt said. Soybean futures for May delivery rose 10.5 cents, or 1.1 percent, to $9.58 a bushel on the Chicago Board of Trade, after reaching $9.6425, the highest level for the most-active contract since March 3. The commodity has declined 8.6 percent this year on forecasts for record crops in Brazil and Argentina, the two biggest producers and exporters after the U.S.
Soybeans are the second-biggest U.S. crop, trailing corn, with a value of $31.8 billion last year, government figures show. March 10 (Bloomberg) -- Investors are the most bullish on the dollar since the collapse of Lehman Brothers Holdings Inc. on speculation the U.S. economy will expand at a faster pace than in Europe and Japan, a survey of Bloomberg users showed. The world’s reserve currency will rise over the next six months, according to respondents in the Bloomberg Professional Global Confidence Index. Sentiment toward the U.S. economy rose among the 1,612 participants in the survey, even as the outlook for global growth fell for a second consecutive month. The dollar strengthened this month to the most since May against the euro on concern Greece’s struggles to close the biggest deficit in the European Union as a percentage of gross domestic product will weigh on the region. The Federal Reserve will raise interest rates before the European Central Bank and Bank of Japan, according to the median estimate of more than 30 economists surveyed by Bloomberg. “Growth differentials and interest-rate differentials, and the fact that the U.S. is so far doing quite well compared with the euro-zone” have benefited the dollar, said Meg Browne, a vice president of foreign-exchange research at Brown Brothers Harriman & Co. in New York and a survey participant. Greece has been “one of the drivers of dollar strength. There are a number of reasons why longer-term, we think the dollar will strengthen,” she said. Sentiment toward the dollar climbed to 66.39 this month from 55.72 in February, according to the survey. The measure is a diffusion index, meaning a reading above 50 indicates Bloomberg users expect the dollar to strengthen. The high for the index was the 68.86 reading in September 2008, when Lehman’s bankruptcy drove investors to the dollar as a refuge. The Bloomberg Correlation-Weighted Index for the dollar rose the next two months. The fallout from the budget crisis in Greece has made German investors the most bearish on the 16-nation euro currency since the survey began in November 2007. Sentiment from German participants tumbled to 20 from 37.5, and dropped to 12.5 percent in France and 21.48 in Spain. German Chancellor Angela Merkel and Luxembourg Prime Minister Jean-Claude Juncker called for regulation of credit- default swaps yesterday to shore up the euro area and prevent a rerun of the Greek financial crisis. Greece’s budget gap, at 12.7 percent of GDP, is more than four times EU limits. Prime Minister George Papandreou’s government outlined measures last week to save 4.8 billion euros ($6.5 billion), including higher fuel, tobacco and sales taxes, as it seeks to lop 4 percentage points off the deficit. The index for the U.S. economy rose to 48.48, from 41.27, while the outlook for Western Europe’s economy dropped to 41.04, the lowest since July, from 49.77. The U.S. economy will expand 3 percent in 2010, more than twice as much as in the euro zone and almost double that of Japan, according to the median forecasts in Bloomberg surveys of economists. Speculation the U.S. economy will grow at a faster pace than those of Europe and Japan is bolstering bets that differences in interest rates may begin to boost the dollar. The Bloomberg Correlation-Weighted Index for the dollar has risen 6.1 percent to about 101.5 from last year’s low of 95.63 on Nov. 17. “The U.S., perhaps not this year, will be one of the first to raise interest rates,” said Fabian Eliasson, head of U.S. currency sales at Mizuho Corporate Bank Ltd. in New York, and a survey participant. The Fed is forecast to lift its target rate in the third quarter to 0.50 percent from a range of zero to 0.25 percent, according to a Bloomberg News survey of 75 economists. The European Central Bank will boost its key rate to 1.25 percent from 1 percent in the fourth quarter, while the Bank of Japan may keep its rate at 0.10 percent at least through the second quarter of 2011, separate surveys show. Bloomberg users are more pessimistic on bonds. The prospect for an increase in 10-year Treasury note yields rose to 70.1 in March, from 68.30 in February. The benchmark 3.625 percent Treasury due February 2020 closed yesterday at 3.70 percent, according to BGCantor Market Data. Expectations for higher yields also increased in Germany, France and Switzerland. The index for German respondents increased to 70 from 69.08. Pessimism climbed to 68.75 from 66 among French participants. In Switzerland, the measure increased to 66.67 from 65.58. FPO 3rd month May futures contract traded RM35 higher to close at RM2685 levels as compare to previous trading sessions with a total of 7,410 lots traded in the market. FCPO price traded higher during trading sessions as bullish export figure indicated arising demand while soybean oil and crude oil electronic trading were traded higher during trading sessions. FCPO price opened high at RM2670 but supported at 78.6% Fibonacci support levels at RM2658 regions before FCPO price surge higher to test RM2720 regions. Technically, FCPO seems met support at RM2650, 50% Fibonacci support levels on the larger wave count in the hourly price chart which hint on larger wave 3 counts underway provided support levels at RM2650 and RM2600 were not violated during trading sessions. However, FCPO price must overcome resistance levels at RM2726 and RM2750 regions in order for FCPO to remain intact with bull rally. FKLI Mar Futures contract traded 12 point to close at 1333 levels as compare to previous trading session to with a total of 7,182 lots traded in the market. FKLI traded higher during trading sessions despite of the regional indices retrace during trading sessions. FKLI reach new high at 1333 regions upon closing to meet at 238.1%, 161.8% and 61.8% Fibonacci resistance levels. Technically, FKLI would continue to trade higher provided manage to overcome selling pressure around resistance levels at 1334 and 1340 regions. However, support levels at 1324 and 1316 seen as critical level in order for FKLI bull trend to remain intact. March 10 (Bloomberg) -- Oil traded near $81 a barrel after falling as the dollar strengthened and an industry-funded report showed an increase in U.S. crude supplies, fanning concern that demand in the world’s biggest energy user is slow to recover. Oil dropped yesterday after the U.S. currency rose against the euro amid concern that the Greek financial crisis will trigger a default on debts by other European countries. The American Petroleum Institute said crude inventories rose 6.5 million barrels last week. An Energy Department report today is forecast to show supplies climbed 2 million barrels. Crude oil for April delivery traded at $81.33 a barrel, down 16 cents, in electronic trading on the New York Mercantile Exchange at 10:34 a.m. Sydney time. Yesterday, the contract fell 38 cents to settle at $81.49. The dollar traded at $1.3611 per euro at 10:37 a.m. Sydney time, from $1.3602 yesterday. A stronger U.S. currency reduces the appeal of commodities as an alternative investment. An Energy Department report today will probably show that U.S. inventories of crude oil rose, according to the median of 17 analyst responses in a Bloomberg News survey. The department is scheduled to release its Weekly Petroleum Status Report at 10:30 a.m. in Washington. Saudi Arabia had 4 million barrels a day of spare oil output capacity that can be absorbed into the market when global energy consumption recovers, the head of the kingdom’s state- owned oil company said yesterday. “Oil supply will decline if there is no investment, so that 4 million could be absorbed by demand alone,” said Khalid al-Falih, chief executive officer of the Saudi Arabian Oil Co., in a speech at a Cambridge Energy Research Associates conference in Houston. The kingdom, the world’s largest exporter, raised output by 100,000 barrels a day to 8.25 million in February, the highest level since December 2008, a Bloomberg News survey of oil companies, producers and analysts showed last month. Saudi Arabia can produce as much as 12.5 million barrels a day, al- Falih said. Brent crude oil for April delivery dropped 56 cents, or 0.7 percent, to settle at $79.91 a barrel on the London-based ICE Futures Europe exchange yesterday. FCPO May Futures contract traded RM49 lower as compare to previous trading sessions to close at RM2650 with a total of 6,714 lots traded in the market. FCPO price traded lower just before statement made on Palm Oil Conference held Kuala Lumpur during trading sessions while crude oil and soybean oil were trade lower during electronic trading. FCPO price plunge lower after manage to rebound 78.6% Fibonacci resistance levels at RM2716 regions. Technically, FCPO price seem complete wave count 5 at 61.8% Fibonacci resistance levels at RM2722 regions and correction phase would expected to take in place in the coming trading sessions where support levels seen at RM2644 and RM2596, both were 23.6% and 38.1% Fibonacci support levels. However, resistance levels at RM2714 and RM2726 must not be violated during trading sessions in order for correction wave to remain intact. FKLI March Futures contract was traded 2.5 points lower as compare to previous trading session to close at 1321 levels with a total of 5,146 lots traded in the market. FKLI was traded mildly lower as Dow Jones were traded weak during overnight trading while regional indices were traded within tight range. FKLI look for lower support at 1316 regions after rebound 61.8% Fibonacci resistance levels at 1325.5 regions before market start to consolidate within range from 1217 to 1221 regions. Technically, FKLI would seen trading on correction wave count provided resistance levels at 1323.5 and 1340 regions were not violated in the coming trading sessions while support level were seen at 1316 and 1302 regions. March 8 (Bloomberg) -- Soybean futures rose the most in more than a week on speculation that China, the world’s biggest buyer and consumer, will boost imports to expand inventories. China will keep reserves equal to as much as 40 percent of annual consumption to ensure food security, and may increase purchases from overseas, said Bao Kexin, the president of China Grain Reserves Corp. The inventory-to-use ratio is almost double the world level of 23 percent. Cofco Ltd., China’s largest grain trader, said it will expand crushing capacity by more than 40 percent this year. Soybean futures for May delivery rose 5.25 cents, or 0.6 percent, to $9.48 a bushel on the Chicago Board of Trade, the biggest gain since Feb. 26. The most-active contract fell 1.9 percent last week, the first decline in four weeks, on forecasts for record production in Brazil and Argentina, the biggest exporters after the U.S. Soybean futures for September delivery rose 0.4 percent to 3,836 yuan a metric ton on the Dalian Commodity Exchange in China. That’s the equivalent of about $15.29 a bushel, Bloomberg data show. Premier Wen Jiabao said last week that the government would seek to increase production of grains, oilseeds, cotton and sugar, raise minimum grain prices and continue stockpiling agricultural commodities. Some of the increased output would go to feed livestock. China, the world’s largest pork producer and consumer, may increase output of the meat to 50.6 million metric tons this year, up 3.5 percent from 2009, the U.S. Department of Agriculture’s Foreign Agricultural Service said in a report last week. Soybeans are the second-biggest U.S. crop, trailing corn, at $31.8 billion last year, government figures show. FCPO May Futures contract traded RM39 higher as compare to previous trading sessions to close at RM2709 with a total of 3,942 lots traded in the market. FCPO price traded higher during trading sessions as crude oil and soybean oil were trade firm during overnight and electronic trading as fear of El-Niño affect of CPO production that directly implicate the CPO supply to meet market demand. FCPO price continue to trade higher territory after supported around RM2670 regions before surge higher to meet resistance levels at RM2726 regions. Technically, FCPO price seems meet temporary wave count at 61.8% and 161.8% Fibonacci objective price at RM2720 regions. FCPO price would expected to retrace lower in the coming trading sessions provided resistance levels at RM2732 and RM2760 were not violated in the coming trading sessions. However, support levels were seen at RM2670 and RM2620 regions. FKLI March Futures contract was traded 20.5 points higher as compare to previous trading session to close at 1323.5 levels with a total of 6,608 lots traded in the market. FKLI was traded higher since open for trading as all regional indices were traded higher due firm Dow Jones overnight trading. However, FKLI was traded slightly lower before end of trading sessions due to some mild profit taking activity. FKLI overcome previous high at 1307 upon open for trading and continue to trade higher to meet wave at 223.6% and 150% Fibonacci objective price at 1327.5 regions. Technically, FKLI seem complete short term count at 1327.5 regions as cluster formation was seen range from 1326 to 1327.5 regions. FKLI was expect to trade lower with condition failed in attempt to search for higher resistance levels at 1340 and 1350 regions in the coming trading sessions. However, support levels were at 1305 and 1288 regions with assumption of effort attempt to cover uncovered territory in the daily chart. A report tomorrow in the U.S., the world’s largest oil consumer, will probably show consumer confidence is at its highest in a month, according to a Bloomberg News survey of economists. Kuwait, the fourth-largest Organization of Petroleum Exporting Countries producer, will maintain oil export limits through June, the Kuwait Times reported on March 6. Crude oil for April delivery rose as much as 42 cents, or 0.5 percent, to $81.92 a barrel in after-hours electronic trading on the New York Mercantile Exchange. It was at $81.86 at 8.25 a.m. in Singapore. The contract increased 1.6 percent to $81.50 on March 5, the highest closing price since Jan. 11, after a report showed U.S. employment declined less than forecast in February. It gained 2.3 percent last week as global equity markets rallied and U.S. refining climbed to a five-month high. Gains in the equity markets are supporting prices, Hassall said. The extent of oil’s rally after last week’s U.S. inventory report was surprising given that crude stockpiles are still rising and gasoline stocks remain high, he said. U.S. crude inventories climbed 4.03 million barrels to 341.6 million in the week ended Feb. 26, the highest level since August and 5.7 percent above the five-year average for the period, the Energy Department said on March 3. Gasoline supplies are just short of the 23-month high reached mid-February. Hedge-fund managers and other large speculators increased their bets on oil prices rising for a third week, the U.S. Commodity Futures Trading Commission said March 5. Speculative net-long positions, the difference between orders to buy and sell the commodity, rose 7.1 percent to 91,417 contracts in the week ended March 2, the commission said. OPEC nations pump about 40 percent of the world’s oil. Ministers will meet on March 17 in Vienna to decide whether to adjust production quotas for the first time since they agreed to a record cut in output in December 2008 as fuel demand tumbled during the worst global recession since World War II. Brent crude for April delivery was rose as much as 42 cents, or 0.5 percent, to $80.31 a barrel on the London-based ICE Futures Europe exchange. It was at $81.31 at 8.19 a.m. in Singapore. The contract gained $1.35, or 1.7 percent, to $79.89 a barrel on March 5, the highest level since Jan. 11. March 8 (Bloomberg) -- The yen fell to a two-week low against the euro as signs the global economic recovery remains on track boosted demand for higher-yielding assets. The yen weakened against 15 of its 16 major counterparts after Japanese exports grew in January for a second month and before data today that economists said will show German industrial output rose. Australia’s dollar touched the strongest in six weeks against the U.S. currency as risk sentiment improved after French President Nicolas Sarkozy said yesterday the euro region is ready to rescue Greece. Japan’s currency fell to 123.60 per euro as of 9:29 a.m. in Tokyo from 123.00 in New York on March 5. It earlier touched 123.69, the weakest since Feb. 23. The yen dropped to 90.48 per dollar from 90.28 after reaching 90.68, the lowest since Feb. 23. The euro rose to $1.3665 from $1.3626. Australia’s currency was at 90.94 U.S. cents from 90.77 cents after climbing to 91.06, the most since Jan. 21. The yen dropped against the dollar for a third day as Japan’s current-account surplus was 899.8 billion yen ($9.9 billion) from a year earlier, when it was in deficit, the Ministry of Finance said in Tokyo today. Exports surged 41 percent on an annual basis. German industrial production rose 1 percent in January after falling 2.6 percent the previous month, according to a Bloomberg News survey before the Economy Ministry report today. The euro advanced against the dollar for a second day after Sarkozy voiced his support for Greece. While Greece doesn’t need assistance right now, “we have measures, we are ready, we are determined,” he said. Sarkozy’s comments are among the strongest by a European Union leader to signal the bloc would bail out Greece if necessary as officials strive to warn investors against making further bets against the euro and Greek bonds. Papandreou’s government last week passed a further round of austerity measures and sold 5 billion euros ($6.8 billion) in government debt. Futures traders decreased bets the euro will decline against the dollar, figures from the Washington-based Commodity Futures Trading Commission show. The difference in the number of wagers by hedge funds and other large speculators on a decline in the euro compared with those on a gain -- so-called net shorts -- was 66,770 on March 2, compared with net shorts of 71,623 a week earlier. FCPO May Futures contract traded marginally RM4 lower as compare to previous trading sessions to close at RM2670 with a total of 9,147 lots traded in the market. FCPO price traded lower after long consolidate before plunge lower despite crude oil and soybean oil traded higher during trading sessions. FCPO price challenged psychology resistance levels at RM2700 regions but attempt was failed hence lead further retrace towards support levels at RM2670 regions, 38.1% Fibonacci support levels. Technically, FCPO price expected to rally upwards provided support levels at RM2620 and RM2596 were not violated during trading sessions. However, FCPO price were expected to encounter RM2726 regions and RM2750 regions as minor wave count show great selling pressure around 50% and 61.8% Fibonacci resistance levels. FKLI March Futures contract was traded 18 points higher as compare to previous trading session to close at 1303 levels with a total of 6,566 lots traded in the market. FKLI was traded higher during trading sessions as Dow Jones overnight trading and regional trading were traded firm which directly effect FKLI trading upon opening. FKLI manage to penetrate previous resistance levels at 1290 regions and continue to surge towards next resistance levels at 1307 regions but encounter short term resistance levels at 1305 regions, 78.6% Fibonacci resistance levels. Technically, FKLI would affirm extension on wave 3 once resistance levels at 1309 were violated during trading session. However, FKLI seems temporary top on short term count where support levels seen at 1292 and 1280 regions. Resistance levels were seen at 1307 and 1350 regions.